One of the most important parts of AA is creating a strong social network of individuals who support your recovery, and you can still do this while in residential rehab. Call 800-839-1686 to find rehab centers that utilize all the treatment options beneficial to you, including AA. According to the National Institute on Drug Abuse, “Most drug addiction treatment programs encourage patients to participate in group therapy during and after formal treatment,” and in some instances, this can include attending AA meetings during inpatient care. If you begin attending these meetings, try to be open to other people and willing to discuss your life and your feelings with them. 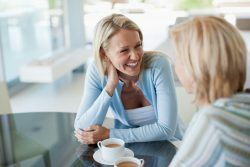 It can be easier to make friends when you have a more open disposition, and when other members and patients start to talk to you, it is important to let them know with your demeanor that you are open to conversation, and eventually, to friendship. Having an open disposition will make it easier to form friendships. Some people may not be ready yet to share parts of themselves outside of the more formal structure of AA or another group therapy program. Therefore, it is important to be respectful and understanding of those in this position and to know not everyone has this desire. If you start talking to someone who seems uncomfortable or asks flat out to be left alone, it is better to seek this kind of companionship with someone else in the program. It can help you to begin talking to those individuals whom you know have interests similar to yours. Your treatment program within inpatient care can be a wonderful indicator of this. If you enjoy yoga and see someone else in the class, you may want to talk to them about it in order to find out if they share your interest. In addition, you can discuss other signs that someone may share the same interests with you (such as their reading materials, the games they play, etc.) but it is important to always be respectful of another’s space. The NIDA states, 12-step groups like AA “can be particularly helpful during recovery, offering an added layer of community-level social support to help people achieve and maintain” their goals. This is still true of AA programs that take place in residential rehab centers, as your fellow patients can also become a part of your social support network that helps you change the way you see your substance abuse and create better behaviors for your everyday life. Remembering the reasons why you are all together in treatment can make it much easier to make friends with other patients and to get to know one another. By becoming part of each other’s support network, you are helping one another stay sober and create a stronger recovery as well as possibly creating a lasting friendship. Do You Want to Find Safe, Beneficial Residential Rehab? Call 800-839-1686 now to find treatment centers that will help you begin your recovery from substance abuse and start living a better life. Our programs use a number of treatment options, including 12-step therapy, to help patients recover from addiction.